You can download Front's iOS app at frontapp.com/ios. 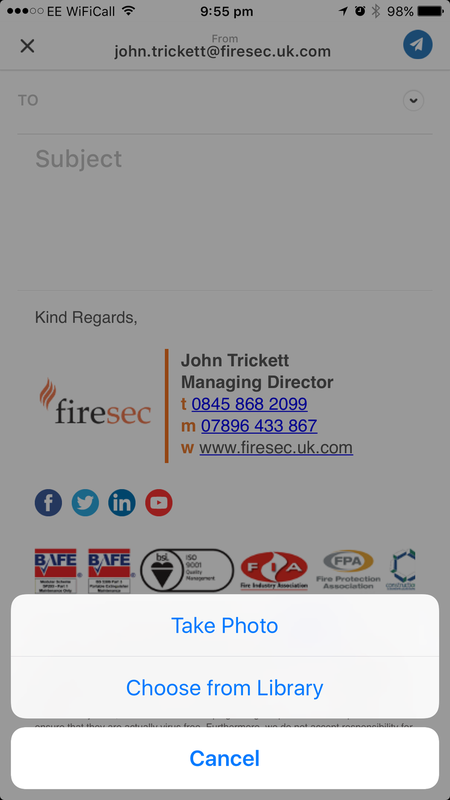 Is there any way of sending file attachments from mobile? There doesn't appear to be an option to 'send using FrontApp' or to select Dropbox attachments direct from the app. On iOS, click the three dots in the bottom right corner, there is an Attach files option. On Android, click the paperclip on the top, and select Choose a file. Cori Morris This seems to only allow attachments from camera or photo album. Not file attachments? John, I see! That's on our roadmap, but not yet available right now. Lukáš Kadlčík Hi there, it's still on our roadmap, but no update on timing yet. Ben Hi there, it's not on our immediate roadmap, but I will share your request with our product team. Hi guys - We just purchased Front for 5 people, paying an annual subscription. We just learned of this limitation and frankly it's unacceptable, as it hinders our workflow and the workflow of any business that regularly sends out tools and PDFs to clients (we're a therapy practice). Can you please escalate this to your product team? This is a basic feature of any iOS mail app and to think we are paying a huge sum of money without this functionality does not sit well. Jordan Robert Axani, are you referring to the ability to send PDFs on mobile?